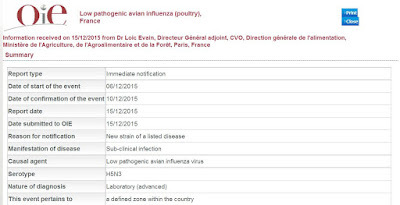 Correction: In my haste, I forgot that an LPAI H5N2 was also reported last week (see OIE notification), and while we've certainly seen LPAI H5N2 elsewhere in Europe, this was reportedly the first such instance in France. Two weeks ago, in OIE: HPAI H5N2 Bird Flu Detected In France we learned of the second new strain of bird flu to turn up in France since late November (the first being LPAI to HPAI H5N1). Seven days ago, in OIE Report: HPAI H5N9 In France, a third new HPAI strain was reported. Today, in the wake of the biggest update thus far (15 new outbreaks), the OIE has posted a notification of a remarkable 4th new strain of avian flu - LPAI H5N3 - reported in three locations in Southern France. 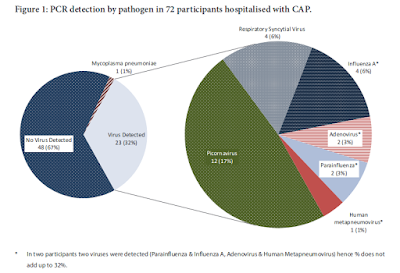 While a low pathogenic virus, and therefore of less concern than the HPAI varieties, the worry is that LPAI H5 and H7 viruses have the potential to mutate into highly pathogenic strains. And we've suddenly been seeing a lot of that lately (see You Say You Want An Evolution?). While the first of these new strains was characterized as a spontaneous LPAI to HPAI mutation, we are still awaiting analysis on the (now) three subtypes that have emerged since then (H5N2, H5N9, and H5N3). It is going to be very interesting to find out what is behind this sudden, and unprecedented, surge in avian flu diversity in France. At the risk of repeating myself, the plot thickens . . . .
Three farms are listed by the OIE as affected by this latest strain of H5.